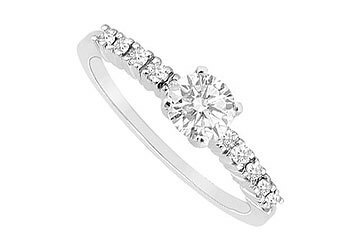 A sleek row of brilliant cut round diamonds are prong set on sides of the band with total diamond weight TDW of 0.25 carat in this 14K white gold semi mount engagement ring. Center diamond is not included and must be purchased separately. This ring is semi mount ready to fit any round shape diamond or gemstone of your choice and also available in bigger center stone. If you supply center stone we will set at no charge. This is perfect way to make ring of your dreams.